trees (how did they not set the place on fire? Long before the advent of Christianity, evergreen plants and trees had special significance during the bleak winter months. Early Romans marked the winter solstice† with a feast called the Saturnalia (in honor of Saturn, the god of agriculture), celebrating that farms and orchards would soon be green and fruitful again. As part of the festivities, they decorated their homes and temples with evergreen boughs. In Northern Europe the Druids,** the priestly class of the ancient Celts, also decorated their temples with evergreen boughs as a symbol of everlasting life. The use of evergreen trees, wreaths and garlands to symbolize eternal life was shared by the ancient Chinese, Egyptians and Hebrews. According to the Encyclopedia Brittanica, tree worship was common among pagan Europeans and survived their conversion to Christianity. Other ancient peoples would hang evergreen boughs over their doors and windows, a tradition that continues today—although back then, there was a prevailing belief that evergreens would keep away evil spirits, ghosts, witches and illness. The decorated evergreen tree first appeared at the turn of the 15th century in the upper Rhineland, an area in the middle western border that includes Bonn, Düsseldorf and Köln (Cologne), cities on the Rhine River. The area is home to many evergreens, including fir, pine and spruce trees. According to TheHolidaySpot.com, in 1605, a groundbreaking moment in Christmas occurred: an evergreen tree was brought indoors and decorated. It occurred in Strasbourg, a city on the Rhine that is now part of France. The tree was adorned with paper roses, lighted candles, wafers, nuts and sweets. The concept spread through Germany, and in 1800 the Christmas tree was brought to the U.K. by Queen Charlotte, the German-born wife of George III, who decorated a small yew tree in with candles, sweets and toys. 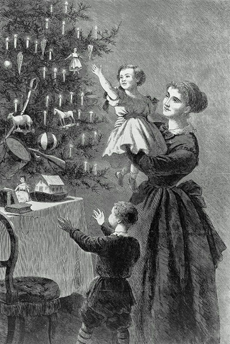 The tradition did not spread outside of the royal court until 1848, when the Illustrated London News magazine published an illustration featuring the royal family gathered around their Christmas tree. That’s all it took for Christmas trees to begin to pop up in British homes. Tinsel was invented around 1610, made from actual silver! Candy canes were created by a German choirmaster in 1670 as a treat for his choirboys. The shepherd’s crook shape made them convenient to hang on the branches of the Christmas tree (see details). Lights followed. In the 18th century, more trees began to be illuminated by candles, affixed with melted wax or pins. Around 1890, Christmas tree candle holders appeared and between 1902 and 1914, small lanterns and glass balls were created to hold the candles. Ornaments were created by German glass-blowers in the mid-1800s. Angels and stars (which represent the Star of Bethlehem) evolved to take their place at the top of the tree. Electric Christmas lights were born in the U.S.A. It was in New York City, in 1882, that the first Christmas tree was lit by electricity. Tree lights really took off when American Albert Sadacca replaced the white lights with brightly colored bulbs. The company he founded became the largest Christmas lighting company in the world. The first artificial tree appeared in the 1930s. The early ones were silver, designed to be lit by a revolving colored light source under the tree. 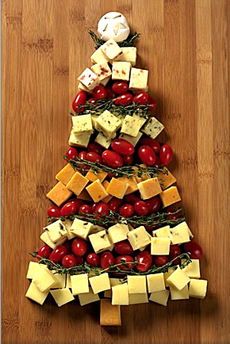 An edible version of the historic Christmas tree. Here’s the recipe. Photo courtesy Cabbot Creamery. As long as you can cut even cubes, this is an easy and fun project. Select your favorite semihard cheeses: young Asiago, Cheddar, Colby, Edam, Fontinella, aged Gouda, Jack, Manchego, Provolone and Queso Blanco, for starters (learn more about these cheeses in our Cheese Glossary). Cheeses that already are formed into rectangular blocks are the easiest to cut into cubes. Here’s the full recipe. *The word derives from the name of a pagan feast lasting 12 days. †The winter solstice, which typically occurs on December 21st, is the shortest day of the year. It’s the on which the noontime sun is at its lowest altitude above the horizon. More. **The Celts and Druids occupied Britain, Ireland, and Gaul (France), and possibly other parts of Celtic Europe and Galatia during the Iron Age. In Britain, they built the magnificent and fascinating monument, Stonehenge. ‡It seems amazing, but electricity in homes and businesses is fairly recent. According to Wikipedia, by 1900 most American cities had electric street lights and most new houses were wired for electricity. By 1920 almost all businesses had electricity, and many houses were converted from gas light to electric light in this period. By 1930 even cold water tenements had electric lights. However many rural areas and farms still did not have lights due to the cost of wiring. By 1950 most homes had electricity.